The ladies of England have a difficult time finding husbands of adequate fortune and situation. Add to that the lunacy that takes the men once a month and now the ladies must contend with prejudices of the type of beast a man may become. How can love be expected to blossom in such circumstances? 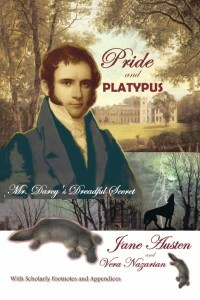 This is want awaits in this month’s selection Pride and Platypus: Mr. Darcy’s Dreadful Secret by Jane Austen and Vera Nazarian. For those of you new to visiting us, we at Dark Jane Austen Book Club have a certain fondness for the darkside where Jane Austen’s exceptional novels, which we love dearly, are mashed up with monsters and mayhem. Vera Nazarian has made it her mission to feed this unholy desire with her Supernatural Jane Austen Series, though to be fair she had no knowledge of us when she began. Vera has previously called down angels and dragons, and resurrected mummies. Now she brings in the Affliction with lycanthropy that seems to be a man problem for all of England. Kind of funny that the men should have a time of the month more troublesome than many women have ever had to contend with. Vera will be joining us this month for a guest post and an interview. There will also be a giveaway! We hope you join us in reading this latest of the Supernatural Jane Austen Series. Winner of a Peculiar June Giveaway!